January 18 is the 18th day of the year in the Gregorian calendar. 347 days remain until the end of the year(348 in leap years). 474 – Seven-year-old Leo II succeeds his maternal grandfather Leo I as Byzantine emperor. He dies ten months later. 1806 – Jan Willem Janssens surrenders the Dutch Cape Colony to the British. 1886 – Modern field hockey is born with the formation of The Hockey Association in England. 1911 – Eugene B. Ely lands on the deck of the USS Pennsylvania anchored in San Francisco Bay, the first time an aircraft landed on a ship. 1958 – Willie O'Ree, the first Black Canadian National Hockey League player, makes his NHL debut with the Boston Bruins. 2007 – The strongest storm in the United Kingdom in 17 years kills 14 people and Germany sees the worst storm since 1999 with 13 deaths. Cyclone Kyrill causes at least 44 deaths across 20 countries in Western Europe. 2008 – The Euphronios Krater is unveiled in Rome after being returned to Italy by the Metropolitan Museum of Art. Year 474 (CDLXXIV) was a common year starting on Tuesday of the Julian calendar. At the time, it was known as the Year of the Consulship of Leo without colleague. The denomination 474 for this year has been used since the early medieval period, when the Anno Domini calendar era became the prevalent method in Europe for naming years. Leo II was briefly the Byzantine emperor in 474 AD when he was a child aged 7. He was the son of Zeno, the Isaurian general and future emperor, and Ariadne, the daughter of Emperor Leo I. Leo II was made co-emperor with his grandfather Leo I on 18 November 473, and became sole emperor on 18 January 474 after Leo I died of dysentery. His father Zeno was made co-emperor by the Byzantine Senate on 9 February and they co-ruled for a short time before Leo II died on 10 November 474. Leo I was Eastern Roman Emperor from 457 to 474. A native of Dacia Aureliana near historic Thrace, he was known as Leo the Thracian. Sir Philip Courtenay of Powderham, Devon, was the senior member of a junior branch of the powerful Courtenay family, Earls of Devon. Year 1457 (MCDLVII) was a common year starting on Saturday of the Julian calendar. Year 52 BC was a year of the pre-Julian Roman calendar. At the time, it was known as the Year of the Consulship of Pompeius and Scipio. The denomination 52 BC for this year has been used since the early medieval period, when the Anno Domini calendar era became the prevalent method in Europe for naming years. Publius Clodius Pulcher was a Roman politician. As tribune, he pushed through an ambitious legislative program, including a grain dole, but he is chiefly remembered for his feud with Cicero and Titus Annius Milo, whose bodyguards murdered him on the Appian Way. Year 748 (DCCXLVIII) was a leap year starting on Monday of the Julian calendar. The denomination 748 for this year has been used since the early medieval period, when the Anno Domini calendar era became the prevalent method in Europe for naming years. In Christianity, the Confession of Peter refers to an episode in the New Testament in which the Apostle Peter proclaims Jesus to be the Christ. The proclamation is described in the three Synoptic Gospels: Matthew 16:13-20, Mark 8:27–30 and Luke 9:18–20. Specifically, Peter declares, "You are the Christ, the Son of the living God." 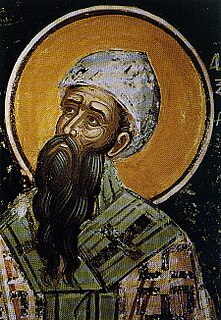 Cyril of Alexandria was the Patriarch of Alexandria from 412 to 444. He was enthroned when the city was at the height of its influence and power within the Roman Empire. Cyril wrote extensively and was a leading protagonist in the Christological controversies of the late-4th and 5th centuries. He was a central figure in the Council of Ephesus in 431, which led to the deposition of Nestorius as Patriarch of Constantinople. Amy Beatrice Carmichael was a Protestant Christian missionary in India, who opened an orphanage and founded a mission in Dohnavur. She served in India for 55 years without furlough and wrote many books about the missionary work there. October 7 is the 280th day of the year in the Gregorian calendar. 85 days remain until the end of the year. ↑ Fik Meijer (31 July 2004). Emperors Don't Die in Bed. Routledge. p. 158. ISBN 1-134-38405-X. ↑ Frederick W. Mote (2003). Imperial China 900-1800. Harvard University Press. p. 105. ISBN 978-0-674-01212-7. ↑ James BIRCHALL (1861). England under the Tudors and Stuarts: a history of two centuries of revolution, etc. Simpkin, Marshall & Company. p. 3. ↑ The Wesleyan Sunday-school magazine [afterw.] The Wesleyan methodist Sunday school magazine. 1866. p. 118. ↑ "Heathrow 'needs a third runway'". BBC News. 25 June 2008. Retrieved 17 October 2008. ↑ "Uzbekistan, Kazakhstan Open Investigations Of Bus Inferno That Killed 52". RadioFreeEurope/RadioLiberty. 19 January 2018. Retrieved 19 January 2018. ↑ CNN, Radina Gigova,. "52 killed in Kazakhstan bus fire". CNN. Retrieved 18 January 2018. ↑ Drewett, Zoe (18 January 2018). "52 people killed when bus bursts into flames on motorway". Metro. Retrieved 18 January 2018. Wikimedia Commons has media related to January 18 .